Proper cat teeth cleaning consists of an oral exam and x-rays under anesthesia in order to properly diagnose any dental disease that may be present. Most of the dental disease in cats is under the gum line. Many cats produce feline odontoclastic resorption lesions (FORL) in their teeth. These are cavity like lesion at the neck of the tooth (where the gum meets the tooth). These lesions cause the roots to be resorbed. These lesions are painful. Unfortunately, your cat will naturally adapt to live with the pain these lesions cause. In these cases, the treatment usually requires extraction of the affected tooth/teeth. Not all cats are plagued with feline odontoclastic resorption lesions (FORL). Only a thorough exam involving x-rays taken by your vet can determine if your cat is living with these lesions. Treatment is curative. However, cats who produce these lesions are likely to produce more in their lifetime and will require annual care. Many cat's will allow you to brush their teeth. 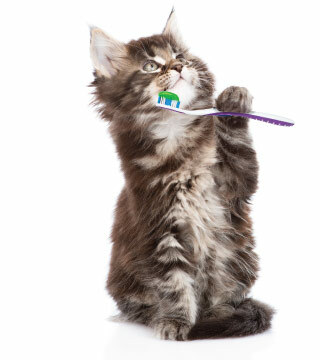 You should brush your cat's teeth daily with specially designed brushes and feline hygiene products. Our technicians are trained to provide instructions on how you can brush your cat's teeth at home. Let us work with you to ensure the best possible dental health for your cat. Your can may very well have dental issues that require attention and NOT show any of the symptoms listed above. However, if any of the above symptoms are observed, please schedule a veterinary appointment right away.